Home / Training Advice / They’re New But Are They Improved? They’re New But Are They Improved? Ask yourself these two very important questions: 1. when is the last time you performed a baseball slide in game play? And, 2. how many times per bout do you turn around 180 degrees and quickly skate in the opposite direction? Did you say “uh, never ever ever?” and “I don’t have that many fingers and toes to count on” ? Exaaaaaactly. So thank the Flying Spaghetti Monster, because WFTDA finally updated the Minimum Skill Requirements! The old 25-in-5 now rolls far less easily off the tongue, clocking in instead at an awkward 27-in-5. 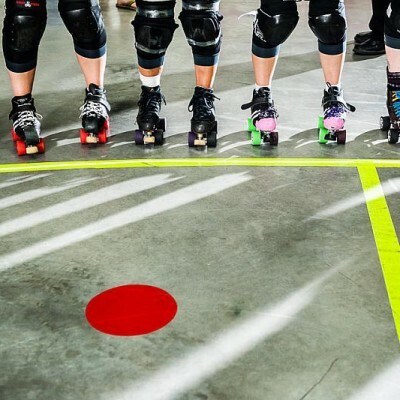 Fans of setting a per-minute pace are fumbling with their abacuses, while the Fresh Meat rock back and forth quietly in the corner… Furthermore, WFTDA has revived and revised the old speed test! Who else here remembers the 5 laps in 60 seconds test? Ancient history comes sprinting back to life (see what I did there?) with the new speed metric: 1 lap from a standstill, in no more than 13 seconds. I don’t think either of these tests is too difficult to achieve, and I applaud the effort to raise the bar on endurance and bursts of speed. 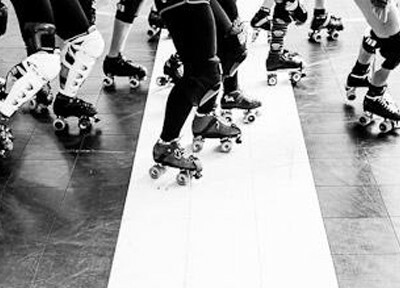 A skater who can’t catch up to the pack, or maintain her position within a fast pack is nothing more than a pylon on the track. This might make life a bit more challenging for newbie leagues and some rookie skaters, but the sport is advancing; the athleticism is quite obviously increasing. It does leagues and skaters a service to push us all to keep up to the elite skaters in our field. VERDICT: Grabbed 4 points and called it off. FINALLY. Sheesh. (PS, the skills include demonstrating backward crossovers, transitioning from forward to backward skating and vice versa in both directions, and just plain backward skating). 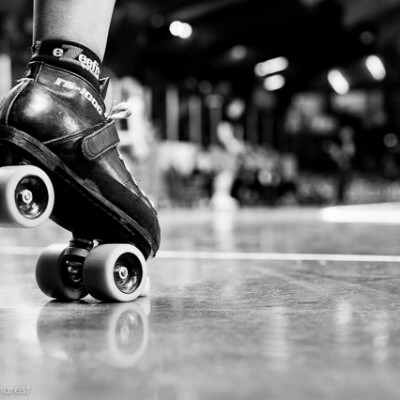 EDIT: April 23, 2013 – a few people pointed out that I misinterpreted the skill called “Reverse Crossovers” to mean backward skating crossovers. In fact, reverse crossovers refers to crossing left over right to move yourself from inside to outside on the track. However, improving/learning backwards-skating crossovers will come in handy for the backward skating skill, since you have to demonstrate skating around the full track. VERDICT: Emerged from the penalty box, got lead and scored 4-0. (in other words, better late than never). T-stops are still in. Great for skating along the boardwalk and lookin’ cool, an easy one for new skaters to master and stay safe, but debatably not the best stop for derby game play. Double knee slides are also still on the list, much to everyone’s PCL ligament’s disapproval. The requirements do say your knees don’t have to touch down simultaneously (our league never required that anyway). But honestly, trainers all seem to be in agreement that this fall is just not a good idea for the knees. And much like the baseball slide, this is one that I rarely, if ever, see come in handy or naturally for a skater. And speaking of baseball slides – they’re outta here! (yes, that was a weak baseball umpire expulsion transition). My league’s fresh meat are high-fiving like crazy because they practice exclusively on a rough asphalt surface (I’m 100% serious). And our coaches are equally stoked they no longer have to teach a skill they never use. Single knee slides have been revised to single knee “taps,” where skaters have to tap down one knee and continue skating without breaking stride. This is much more relevant than the old way of having skaters come to a full stop, and demonstrates necessary leg strength. The bizarre and pretty much useless 180 Degree Turn Single Knee Fall goes buh-bye in the new version, but so does the 4 point fall, which is perhaps the position most of us inadvertently find ourselves in more often than any other unplanned visit to the track visit. The new skills include several additional stepping-without-rolling skills like grapevines, shuffles, and ‘quick steps’. There’s also a 30-second balance on one skate while stationary (tip: practice in bare feet with eyes closed – if you can master that you’ll do just fine on skates). No change to weaving through a pace line, however the weaving through cones drill is now better defined – there’s a 6-second limit, and the 10 cones are 5′ apart instead of the old 6. Hopping gets more realistic, with a 6” obstacle (a leg?) instead of 3” (a lost toe stopper? ), and 18” of lateral movement required. The new test also specifies you must be skating at a “brisk” pace to start. I’m sure these hopping changes in particular will terrify some, but if you can’t dodge a fallen skater on short notice, you’ll spend a whole bunch of time sniffing your sport court anyhow. Several of the skills descriptions have been updated or added to clarify that when plowing, a skater must not be in such an extended position as to trip others, or prevent her from immediately starting to skate again. This falls in line with the latest coaching and training I’m hearing back from skaters attending major bootcamps this year – skating within your personal space, stopping small, and starting or sprinting small seem to be a big focus. In addition, plowing is now specified in the requirements as being required during the positional blocking skill. VERDICT: that skater’s got all the latest dance moves! The skills test has moved in the right direction for sure. It’s not a grand slam, but many of these updates seem designed to better align the requirements with current game play in our ever-evolving sport. Being the first update in nearly 4 years, it’s long overdue, even if it continues to have a few rough edges. Now my question to you! How does your league go about administering skills tests? Do you test veterans every year? Do you go through line by line or only formally test certain skills? Do you record scores or just an overall pass/fail? I’d love to hear your thoughts in the comments! 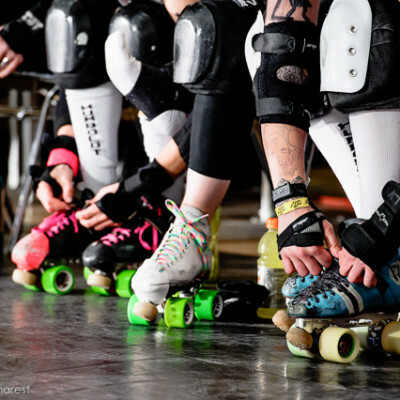 Photo courtesy of my favourite skate shop, www.rollergirl.ca !